Sandpaper discs in a multitude of sizes, grits, and hole configurations. From various manufacturers. 5" 220 Grit Sanding Disk W/Vac Hole PSA Back 50/Box. 5" Sanding Disk 80 Grit Hook & Loop 5 Hole. 5" 80 Grit Sanding Disk No Hole PSA Back 125/Roll. 5" 80 Grit Sanding Disk No Hole PSA Back 50/Box. 5" 80 Grit No Hole Velcro Back Sanding Disk.Also known as Hook & Loop. 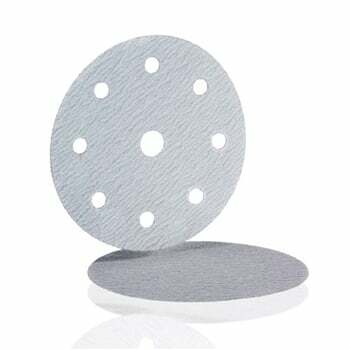 6" 120 Grit Sanding Disk w/6 Hole PSA Back 125/Roll. 6" 150 Grit Sanding Disk W/6 Hole PSA Back 125/Roll.